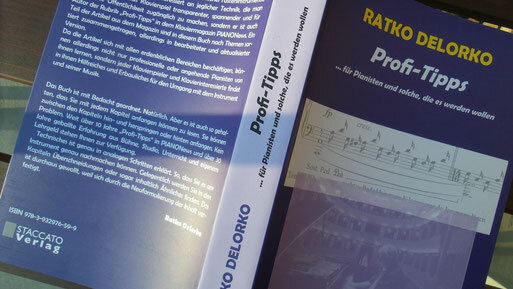 Selected Publications: The Book on the Piano - Zeitklang - Ratko Delorko - Pianist, Composer, Educator. Dealing with historical instruments: From Cristofori to Broadwood and Streicher. How to treat them and how to gather insights and experiences on a period instrument. What can be transferred to the modern one? Historical instrument or over-priced trash? Not every old piano is a valuable period instrument. And if there are apparently valuable instruments how to find out where the traps are. Beginning with the question: Original, restored or rehistorized? Musical temperament: News from the past from old temperaments, their musical effects and the character of the keys. The cross to bear: ornaments and tempi. About 90% of the performers are not sure how to deal with embellishments in baroque and classical music. Or they don’t care and wake up in a competition being kicked out in the first round because of wrong style and tempo. 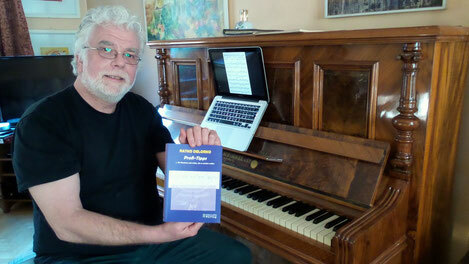 Age-old stumbling blocks: How to perform baroque and classical music on a modern piano. Dos and don’ts. Always in a hurry….. the problem of tempo in baroque and classical. Does Allegro mean fast? Before 1825 not really, it was a description for a mood: Happy. Not necessarily fast. In the 1700s a horse was fast or a runner. While riding you could see each leaf on a tree and flowers. Today we speed on the highway, making phone calls but we see only green. And: the modern piano allows to play really fast. But the composer’s composed under the diction of their fortepianos and had a complete different idea of speed and sound. Agogic: To move or not to move the tempo. And if so - why when or where to move? Interpretation: How to deal with only five notes and make them interesting and nice. From here interpretation starts. Practicing–thinking strategically. How to be quick an efficient…. Nearly no professional player can effort to practice 8 hours per day except perhaps in holidays. I believe that students learn best when they are exposed to different ways of understanding the material: reading, practicing, and hands-on experience. Students, on the other hand, often focus on the single issue of how many hours they spend practicing. Unknowingly, they may practice 8 hours to obtain results they could have achieved in 2 hours. It is important for students to develop sensible practice strategies. In the absence of good strategies, their efforts may be counter productive. For example, a student may spend a lot of time repeatedly playing a long passage at a fast tempo without expression, thinking that he is improving his technique. I call it fingergym. The student does it every day, not aware that his brain is saving information from the experience, regardless as to whether it is valuable or wrong information. The result is that the learning process takes too long and is not reliable under the stress of public performance. This chapter offer solution with conscious practicing, using the right memory slots and lear peaks. Friendly takeovers (which hand plays what, what is allowed, what works?) Composers write correct as composers - voicing, counterpoint etc. 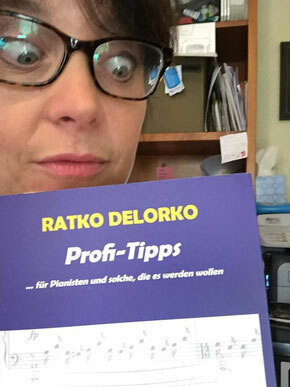 As they write for professional players they know the pro will find the best pianistic solution. Where what to takeover? Does it musically work? On scales and arpeggios. The most common patterns in classical and romantic piano music. How to avoid common problems and companies the different size and key dips on the modern piano compared to the period piano. The ongoing struggle against forgetfulness. How to make the memory reliable and safe. This chapter offers learning techniques. To memorize or not to memorize? To play by heart or not? Pros and contras. Sitting well. The ideal playing position is mandatory for a relaxed playing. There is not the one and only position but the personal one. Tips on buying a piano. As teachers and pianists we are often consultants for students or institutions when a new instrument is needed. Play and enjoy the piano is not enough. Where are the traps and what are the criteria for a good instrument? First-aid for your piano. A hammer is stuck. A string is cracked. A key is blocked, there is a nasty noise coming out of the soundboard. It happens always shortly before a concert. What you can do, what are you allowed to and what you should avoid. The feel of the keys (in the sense of ivory, plastic, acrylic, ebony....... etc…) There is a bunch of different key surfaces. Plastic, acrylic, ebony, ivory, mammoth, bone and wood. What is the tactile difference and the influence on our performance. Independent teaching. Your own studio is a great thing to have. What do you have to respect before opening and where are the traps? Accompanying and guiding. How to deal with singers and instrumentalists. Their psychology and how to guide and help them. Dealing with the cute little ones… How to work with kids. Are they little adults? Or do the parents need help? "I'm don't want to play anymore!“ The classical sentence. A teenager wants to quit piano lessons because horse riding or soccer is more fun. How to deal with that common problem. Working with adults in piano lessons. After a lifetime being a decision maker, it it not easy for an adult enthusiast to take again the position of a pupil. And: they have fear. How to encounter the adult students world. The big performance. Dos and don’t s on stage and in exams. The some different open-air performance. Open air concerts in the summer heat have their issues. From mosquitos to the miking of the piano. The agony of choices. Programming for concerts and exams. How to make the right choice and what are the criteria. The competition pianist. Piano competitions became a kind of tourist industry. About 100 competitions are considered „important“ world wide. All first three prize categories can call themselves winners and want to perform 70 gigs per year minimum. Next year the next contestants are upcoming… Is winning a competition still an option for a career? Piano and orchestra / A game of cat and mouse, or, who is going to win? Sometimes you get gigs as soloist with an orchestra. This is a great opportunity but will not happen very often. Pianists who burn themselves in a piano concerto will have short careers. Where are the moguls? Creative windows. They are not open very long. At night, in the early morning, on the highway or in the bathroom. Great ideas and solutions but how to grab and fix them? On the difference between consumer- listening and technical-listening. There are a lot of different options how to hear. As a consumer or as a pro. Enjoy just music or analyze the sounds. Where is the switch? Why we have contracts. Musicians do not like to read endless contracts. But they should…. Contracts are to be found for studios and for performances. What should you put in and what you don’t need? GEMA / GVL (This is perhaps parallel to ASCAP and ?? ?, perhaps only in Germany?) GEMA corresponds to ASCAP, GvL is for performers. How to deal with the institutions and what they really do. Eat this! People who are in professional sports keno it very well: Their nutrition decides about their results. Musicians don’t care. You can influence a big deal on your performance with the right nutrition and prevent from deseaster. We are rolling, Recording! – Common techniques and when you might need them. How to behave in a recording studio and the basics of technology you should be familiar with. How much computer power does a pianist need? Do pianists need a computer? They need. From hard disk recording to Long Distance Lesson. Shooting your own videos. Technical basics of video recording. Years ago, pianists were always composers and composers were usually pianists, or at least capable piano players. And both were improvisers. Improvisation was often used as a source for later compositions (the root of the word composing meaning to compile). This was so until the beginning of the 20th century. Following Rachmaninoff and Gershwin the art of improvisation became extinct in classical music. Classical pianists became interpretive artists although improvisation lived on in other musical fields, such as Jazz, Rock & Pop, and to a minor degree in so-called "Contemporary Music". Composers became "workers at the desk of experiments.'' Old ways of composing were abandoned and, new ways - far more complex but more artificial, too - were created. Composers and performers made marginal experiences. I think nobody puts into question that the development hat to be like this. The piano cycle ZEITKLANG returns to the roots of the compositional art: it was written by me to fit my hands and my performance style. This simply means that ZEITKLANG has its origin in the improvisational, searching hand, and that it blends that improvisational process into a formal composition. In this work, the musical thought - originating in improvisation - is condensed and distilled until it is reproduced in a simplified way without becoming merely simple. For example, as I compose, I love to employ the techniques of omitting, five-note-themes with alternation, and warped rhythms becoming straightened out again as they complete their cycle. Let's compare this process to viewing images that emerge from reflective light. The light is comprised of a spectrum of colors. If you change the mathematical percentages, you will change your eye's perception of the reflected image. It is not much different working with notes: Every note mathematically separates into partials with octaves, fifths, and thirds dominating. The other partials (up to the seventh and ninth) remain in the background where they add color to the sound. The more distant partials have even less effect. In every note, we feel the dominating intervals that comprise the sound as pleasant sensations. Similarly, most of us find the deep blue sky with little white clouds, the turquoise colored caribic sea and the red of dusk and dawn to be visually attractive. Have you have already begun to imagine these pictures? Why? Because the evolution of our human brain resulted in associations with these proportions of the various light waves, and this visual stimulus excites our emotions. The same thing happens with notes. Certain fundamental frequencies and their partials stimulate our emotions according to their relative proportion. In a figurative sense, the composer defines the nuances of the color of the sea from grey-black to turquoise-blue. The duty of all music is to excite our senses. Since every day presents us with plenty of stress, I give myself the goal of transporting the listener into an another world - not necessarily an ideal world - but one which offers a generally positive feeling. Like the Scottish say, ''A 10 year-old malted drink can be absolutely rough while drinking it. But after a while the comforting taste of mussels, peat and moor remains a long while and narrates fairy-tales of old times.'' Cigar? I move quickly into dreams. Putting it another way: ZEITKLANG takes the familiar sounds of our time - with a lot of consonant harmonics and a few, well directed dissonant - and creates a pianistic and joyful performance punctuated with conflicting rhythmic patterns.